A place of worship since 460 A.D. 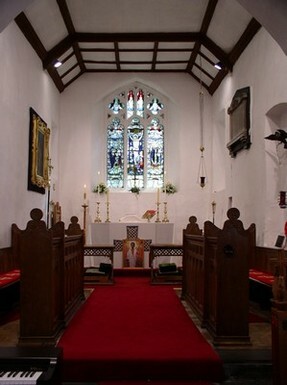 The Parish Church of St.Teilo occupies the site of one of the earliest Christian settlements in Wales. The Welsh name of the village is Llandeilo Ferwallt. Which means “Church of St.Teilo in Ferwallt”, and has a number of interpretations. According to the Book of Llandaff, the church dates back to 460-490 A.D. when Teilo established a Llan (Church) hidden in a dell above the stream. This was an enclosure, probably no more than a simple wooden fenced area, open to the sky, where the faithful met for worship and to celebrate the Eucharist. Later, a cell or small Chapel was constructed on the site. In the year AD 1130 the Pope settled the patronage of the Church on the Bishop of Llandaff and it remained in that Diocese until 1920. Thus Bishopston derives its name from having been, “the Bishops Town”, an Episcopal Manor with its Court Leet, until 1923. The Church, dedicated to St.Teilo, still keeps its ”mapsant” or Patron Saint’s Day which is on the 9th of February. The tower can be described as English or Norman and, with it's simple construction, is typical of Gower Churches. Both the tower and the main building date from the late 12th or early 13th century. The roof was made of thatch until 1831, but was in such a dilapidated state that a few weeks after the new rector arrived, it collapsed into the nave. The battlements were probably restored in the 19th century but the tower was undoubtedly designed as a safe refuge for the villagers from sudden attacks by marauders from the sea. The clock was purchased in 1886 having given many years service on the Old Brewery in Swansea. The bells are dated 1713 and 1714, weigh 6 cwt and 4 cwt respectively. A further notable architectural feature is the “corbel table” of Welsh pattern which runs around the tower below the battlements. Built in 1851, probably to commemorate the 20th year of the rector, the Rev David Jones. The internal layout of St.Teilo’s may appear quite traditional, but it has seen many changes over the years. In the 18th Century, the time of square pews, the rector had two such boxes erected in the chancel for his family and friends. During the long period, of 60 years, that David Jones was rector, the church was typical of the Georgian period of ugliness, the interior was plain and unadorned. The choir and orchestra were stationed in a gallery at the west end of the nave, whilst the services were extremely evangelical in form. On the north wall of the chancel hangs an oil painting of the Madonna and Child, the artist and date are unknown. On the south wall there are some interesting features. In the corner is a stone piscina, which was a sink in the form of a stone basin formerly used in the Mass. Between the windows is a wall safe known as an aumbrey where the Sacrament can be held in readiness for the sick. The Alcove holds the “PEACE” sculpture, which is dedicated to the memory of all who died in War and the Holocaust. It was created by William Sked of Murton in 1995. The east end of the chancel roof is panelled and the wooden ribs appear to be part of the original roof. The Chancel floor is paved with Ancaster Flags, from Lincolnshire, and blue Honiton stone. Before the restoration of the Church in 1927 there were several people interred beneath the chancel. These were removed and buried in the churchyard, and the tombstones were placed along the wall of the old school. In 1891 the new rector, Peter Potter, introduced much needed improvements at the east end. He transferred the choir from the west gallery to the new stalls in the chancel, and simple choral services became the established rule. The rector also provided a “Holy Table” of carved oak on which to celebrate Holy Communion and a dossal, an altar hanging, and cross were subsequently added. Later a new pulpit and lectern were added. He also introduced the eastward position and the use of coloured stoles. The nave seats 150 people in open pews, installed in 1896 and replacing the old traditional pews built to improve the church in 1836. There is a fine hammer-beam roof which was revealed in 1927 when the old ceiling was removed and opened up to the roof. The walls of the nave and the chancel were also plastered and painted at that time. Several early English Lancet windows are to be found in both the nave and the chancel. The perpendicular style windows are all modern installed in the 19th century .The large window adjacent to the pulpit was blocked up around 1869. Is late Norman, carved out of a single square block of limestone, standing on a circular stem, the oak cover is modern and was presented to the church in 1925 by Helen Morgan. St Teilo's church has many stained glass windows throughout the building. Erected to the Glory of God and as memorials to individuals and subscribed by groups or families. Many of the stained glass windows were designed by a local artist, John Edwards. The St Francis window is dedicated to the memory of Gerald Bellingham. A window dedicated to the memory of Thomas Lloyd. A lifelong loyal parishioner and churchwarden. The St Teilo window is dedicated to the memory of Ronald Thomas, rector from 1960 to 1972. This window depicts St Teilo riding a stag. When he was offered all the land he could cover in one day, he chose the fastest animal. He and his brothers then planted considerable orchards on the land and their fame spread throughout Brittany where these events took place. Lancet Window representing St. Ludocus, patron Saint of the countryside, dedicated to the memory of Mr. and Mrs William Jones of Rock House. The East Window was the first stained glass window to be placed in the Church, and is a Memorial to the seven men of the Parish who gave their lives in the Great War 1914-1918. The window contains three lights. The centre one reveals our Saviour on the Cross, the others represent St.Teilo and St David with a soldier kneeling. The two light early English Window- has stained glass representing St.Simon and St.Jude, placed in memory of Rev. Peter Potter, Rector (1891-1913) and his wife. The face of St.Simon is said to be a likeness of Peter Potter and in the lower right-hand corner is a portrait of Mrs. Potter. Small lancet stained glass illustrates two of the favourite symbols used by Rev Brian Evason, the candle bringing light. The light of the world and “Professor Mouse”, from his great collection of mouse-parables. This window is one of two placed in memory of Rev. Brian Evason (1973 –1993). The Millennium Window Installed in 2000, by public subscription. It depicts places of worship in the village and the river disappearing underground in Bishopston Valley. This window -presented to the Church by Dr.P.Cosgrove in 1969 is in Memory of his Wife and has a series of interesting features. In the left hand window, the top figure represents Mary. Below it is a casket- a symbol associated with Mary. Below that again is the badge of The British Medical Association; at the base is a medallion of Three Cliffs Bay. In the right hand window – the top figure represents Martha. Beneath is a bunch of household keys- the symbol of Martha. Below this is the symbol of St.Luke-The Physician. At the base is another Gower view, Worms Head, Rhossili. The small lancet Peace window, in the vestry, is also in memory of Rev Brian Evason. The small stained glass under the organ balcony was donated by St. Thomas Church, Eustis, Florida. DEO ET ECCLESIA DE BISHOPSTON” and around it “ EX BONO FRANK DAVIES A.M. RECTOR IBID ANO DOMINI 1717” . A modern Silver Paten, having the Hallmark of 1891 with the maker’s mark TP, was given by Peter Potter. The pair of brass candlesticks were presented to the church by A.O.Thomas. The Altar Cross is of plain brass. The Parish Registers begin in 1716 and are complete down to the present day. The church also possesses copies of the Bishop’s transcripts of the Parish Registers , the earliest is dated 1671. ​90, Bishopston Road (01792 232012) for those wishing to view the church. Copyright © St. Teilo's, Bishopston 2004 - 2015.